After all, you have almost everything you need to film a shot-for-shot remake of a big-budget movie, right there on your phone. A camera. A script app. Decent lighting. A boom mic. Oh wait, your phone doesn’t have a boom mic. 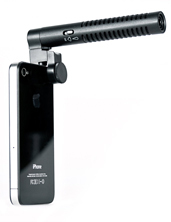 Allow us to help with The iPhone Boom Mic, a glorious cinematastic attachment for your iPhone, available online now. Next, you’ll need a project. Well, no offense to Mr. Gary Ross, because The Hunger Games was great—you loved Woody’s hair, you really did. But something was lacking. That something: your direction. Hit the set with your iPhone and this. (This is where that green screen you put in your den really pays off.) Attach this to your phone’s headphone jack, and switch the button to the “directional” setting—this will capture all of the sound from the huge battle in the wilderness (or your front yard). But before any intimate dialogue—say, your breathtaking recreation of the cave scenes—set it to “super-directional” for precise recording of the dialogue. You and Jennifer Lawrence have amazing chemistry.